CounterSketch is a great tool to use to create customized jewelry and now Oletowne Jewelers is utilizing it to make extraordinary pieces. What is CounterSketch? It is a software program which assists the jeweler with creating custom design pieces right on their showroom floor. 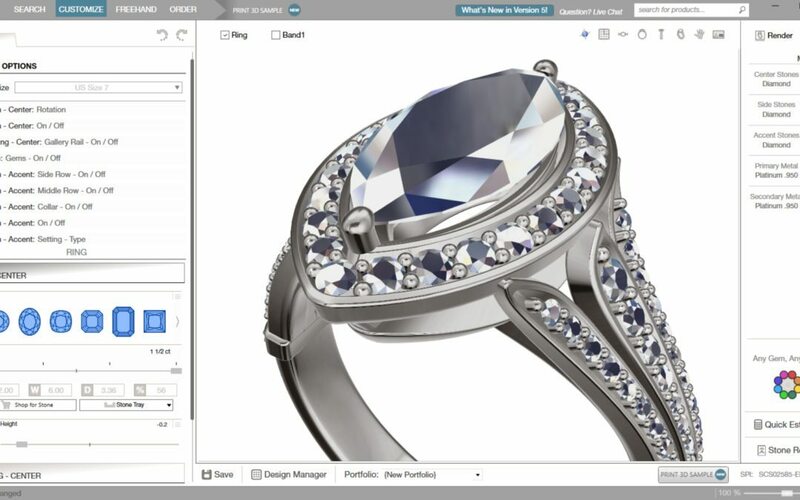 In simple terms, CounterSketch gives the jewelry professional the ability to show a customer what their custom design will look like in real life on a computer screen. CounterSketch software allows the professionals to create the perfect piece by changing center stones, accent stones, metal qualities, shanks, prongs, and much more right on a screen in full 3-D. Everywhere we look today, 3-D technology is radically changing the way we live. It impacts how products are designed and made and how we experience life and entertainment. And now, with the use of CounterSketch, Oletowne Jewelers brings 3-D technology to the art of jewelry making. This computer-aided method of making jewelry is fast becoming the best, most effective way to create the jewelry piece of your dreams. The first step is to select a starting point design from the available options. Then, using the 3-D design software, let Oletowne Jewelers use their creativity to customize every detail of the jewelry from stone size and shape, to color and other options. When you are satisfied, Oletowne Jewelers will build your jewelry from the computer file. The finished product is a totally unique, one-of-a-kind piece, that you helped create. Oletowne Jewelers is one of the lucky few jewelry stores in the United States who are able to offer this service. CounterSketch is the most advanced method for designing jewelry available today. It makes shopping for jewelry a unique showroom experience. Stop by today for a demonstration or contact us to make an appointment. We would love to show you what we can do.